My brother only eats 4 things. He's the one on the far left. This is no joke. Last year I made him a mashed potato panini with our thanksgiving leftovers...He still talks about it to this day. Despite being probably one of the pickiest on the planet, I love him for his weirdness. I remember at one point he would refuse to eat anything besides mashed potatoes...And I dunno about you, but mashed potatoes at every family meal got old real fast. Not to him though. Every bite was like Christmas morning. That's what I am assuming anyway...It had to be! Why else would you eat it for every meal?! I also have another brother who won't eat his food if you touched it, or if other food was touching it. And then there is me who won't eat meat or cheese, and prefers an abundance of spinach and hummus. Don't forget about my hubby who prefers to eat food that is still mooing, if you catch my drift. I bet you can guess how much my mom LoVeS to cook dinner for the whole family! First take a whole head of garlic. Cut off the top of the garlic. Peel off some of the extra skin around the head of the garlic. You don't have to peel it all off, because your want some of it on to leave the cloves together. Take a sheet of foil and place the garlic head on it. Drizzle with a little olive oil, and sprinkle with salt and pepper. Fold the garlic in the foil and cook in a preheated oven of 400 degrees for 40 minutes. When it's done it will look golden brown and smell like heaven! 2. While the garlic is roasting wash, peel, cut, and dice the rutabegas, parsnips, and potato. Luckily I knew what these were. Only because I've made these fries. To.Die.For. 3. Add diced veggies in a pot of water and boil for about 45 minutes. Maybe longer (maybe shorter). I used a BIG (too big) pot of water, so it took longer to boil. So adjust the time to when the veggies are soft and cooked. 4. When they are cooked, drain them and put them back in the pot. Add the butter, a little bit of milk, and the whole head of garlic. 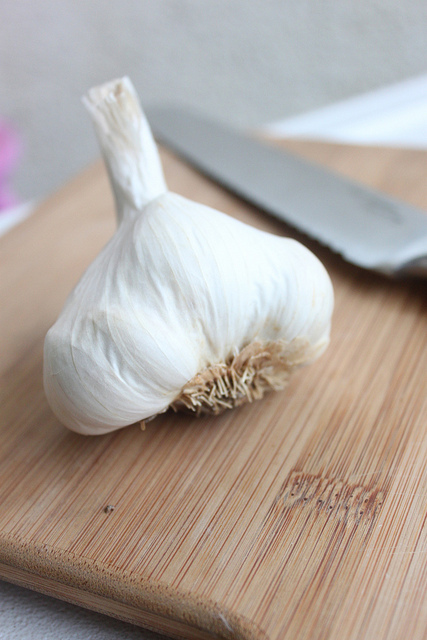 The garlic will just fall out of the head simply by squeezing the bottoms and using a fork to aid them out. 5. Using a potato masher or beaters, mash the veggies together until smooth and creamy. Adding more milk will make them smoother. Sprinkle with salt and pepper. (I also like to add a little paprika and nutritional yeast.) You can mash them as creamy as you would like, or as chunky as you would like. I prefer a chunky monkey! But what about that gravy? 1. In a saucepan, melt butter on medium/low heat. Sprinkle in flour and whisk until thick. Pour in veggie broth little by little, whisking until desired thickness is reached. I used a box of veggie stock and just kept adding more and more until I was satisfied. I used about 1/3 of a 32. oz box. 2. Pour over mashed potatoes or drink straight from pot....once cooled that is. My other brother ate it, just as long as it wasn't touching his green beans. Know one even knew that there were parsnips...rutabagas....really anything nutritious in them. I hate to admit it, but I'm growing up. Even though I'm not as old as my husband, I would consider myself a mature adult. My choice of TV shows might scream others wise..And even my wardrobe. Trust me, if I could pull off a huge pink tutu like Baby Boo, I would totally sport it. I just don't think it would do wonders for my booty. Mature people also use the word booty...often. Now, I go specifically to the mall knowing that I am going to walk into home decor stores, and I get beyond happy when I see cute furniture and stylish pillows..
And sometimes I like to pretend that I can decorate. I like to think that someday I'll make friends in this city I've lived in for the past couple months, and when I do they can come hang out at my pad. This seriously was probably the easiest project I have ever done. It's super simple, and you can design it any way you would like. To start off, I bought a cheap-o chandelier from a thrift store for $10. It was kind of bent, and missing a lightbulb, but It worked perfectly! First I sprayed it lightly with a primer, and then finished it off with white spray paint. I didn't fully spray the chandelier, because like the rest of Baby Boo's room, (dresser and table), I liked the unfinished/vintage look. Then I hung little crystals that my mother-in-law had bought from Tai Pan.. This chandelier is for Baby Boo's room. I promise someday I'll reveal all of Baby Boo's room, not just in little pieces. And shop at Pottery Barn.